Here's our Brand new Jakshax, Hookin' Tightliner XL Edition. It is a 18'er. 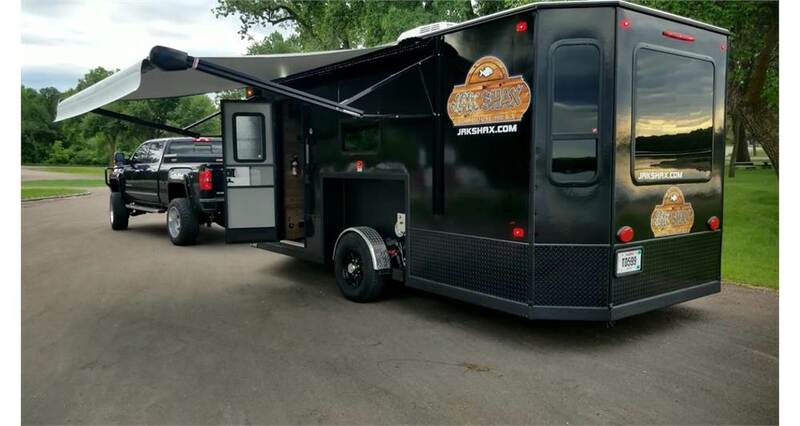 It comes with 46' Dinette, 2 bunks, fold out queen bed, AC, range with an oven, bathroom, optional dry flush charger 110 volt, 30k btu LP furnace, digital TV signal finder, led ground lighting, usb outlets, extra storage space, rear heating, ultra therm windows, rear bump out, heavy duty power awning, outside lighting, powered ventilation and a stereo/home theatre system to watch whatever you want on the ice with the same sound.